In the first edition of the Chopin Mazurkas Op. 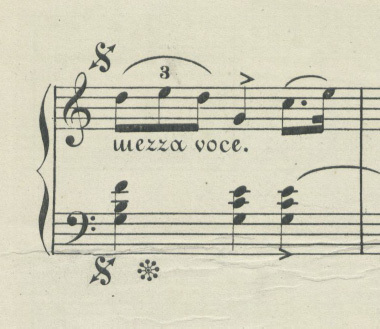 7, there is a lovely segno symbol used. Has anybody made anything like this? The text font in this edition is also lovely - I wonder if they were letter punch forms? See attached image. The scan is from IMSLP. I'm not trying to recreate this edition, I just want to borrow the graphic elements.